View the shareable poster here! View the shareable micrographic here! Offer is valid from 2AM NZDT, February 1, 2018, to 2AM NZDT, March 1 2018. 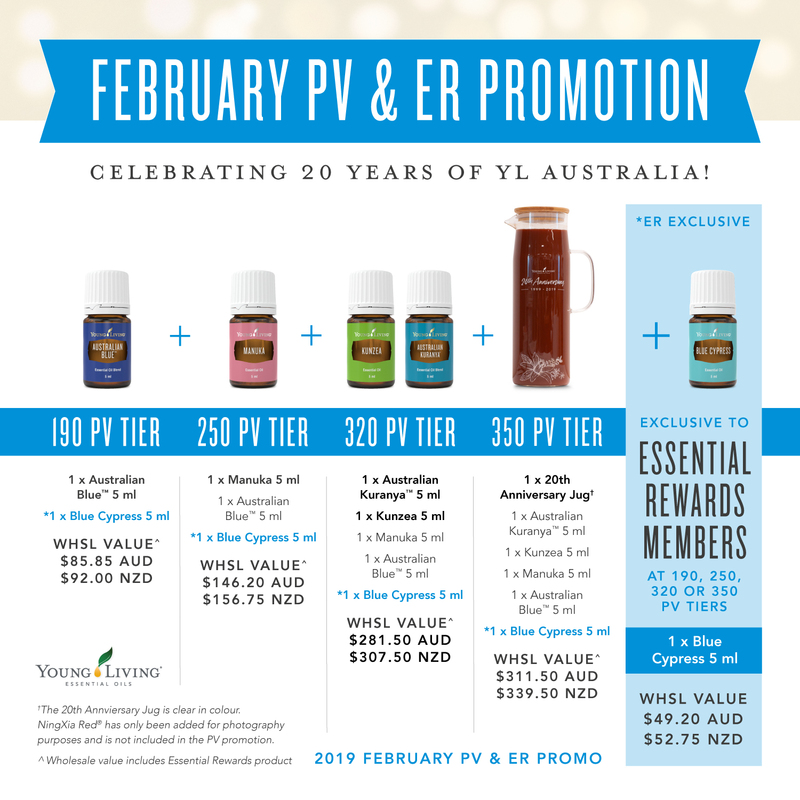 Limit of one free Australian Blue 5ml, Manuka 5ml, Australian Kuranya 5ml, Kunzea 5ml, and 20th Anniversary Jug per qualifying Standard Order. Limit of one free Blue Cypress 5ml, Australian Blue 5ml, Manuka 5ml, Australian Kuranya 5ml, Kunzea 5ml, and 20th Anniversary Jug per qualifying Essential Rewards Order. Care instructions for 20th Anniversary Jug: handwash in warm, soapy water. Not dishwasher safe. Single orders over 190 PV, 250 PV, 320 PV or 350 PV do not earn duplicate rewards. Available for all orders via phone, fax, post, web, or email custservnz@youngliving.com.